A few more thrillers this time around, most of which I bought – this has been part of a conscious decision on my part to read more non-SFF books. Mainly because I think I’m overdosing on those genres, and I feel like I’m missing out on authors I ordinarily would love to read. She calls herself Calexa Rose Dunhill — names taken from the grim surroundings where she awoke, bruised and bloody, with no memory of who she is, how she got there, or who left her for dead. She has made the cemetery her home, living in a crypt and avoiding human contact. But Calexa can’t hide from the dead — and because she can see spirits, they can’t hide from her. Then one night, Calexa spies a group of teenagers vandalizing a grave — and watches in horror as they commit murder. As the victim’s spirit rises from her body, it flows into Calexa, overwhelming her mind with visions and memories not her own. This is Charlaine Harris’s first original graphic novel project. Teaming up with fellow New York Times bestselling author Christopher Golden, they have come up with something pretty interesting, too. The Pretenders is the first part of a trilogy, and as a result does not present a tidy ending. In fact, rather the opposite: by the end of the book, Calexa has helped solve one crime, it’s true, but along the way readers will be confronted by a number of intriguing questions and mysterious goings-on – be they Calexa’s memories or her new-found powers. The artwork throughout is pretty good – it’s nothing particularly unique, but it is clean and clear; and overall the compositions enrich the story and realise it in a vivid, eye-catching manner. The story itself moves at a good clip: despite the relative slimness of the book, the story doesn’t feel rushed, but not does it feel drawn out. In fact much of the story focuses on Calexa getting used to, and making her life in the cemetery (now you know where the series title comes from), and I actually liked this. The Urban Fantasy equivalent of the Origin Story, perhaps? The synopsis states that she avoids people, which is for the most part true, however, despite her sneaking about, there are a couple of people who learn of her existence and extend a helping hand (albeit clandestinely). For me, it was this part of the story – one of unexpected kindness and help – that stood out. No doubt, with parts two and three, the supernatural shenanigans and Calexa’s past will be unveiled. I’m certainly looking forward to finding out the true about what brought our protagonist to the cemetery in the first place, but in the meantime, The Pretenders is a great introduction to this setting. Recommended for all fans of Harris’s and Golden’s previous prose-fiction, but also Urban Fantasy as a whole and comics that dabble in similar territories (for example, the Buffy graphic novels, which Golden has also worked on). Let’s start with an introduction: Who is Christopher Golden? At 46, you’d think I would have an answer to that, but I’m still working it out. I’ve been writing full time since 1992, with the sale of my first novel, OF SAINTS AND SHADOWS. Since then, I’ve written or co-written or edited about a hundred books, mostly fiction in the horror, fantasy, mystery, and thriller genres. I’ve written comics and short stories, video games and an animated web series, radio plays and screenplays. 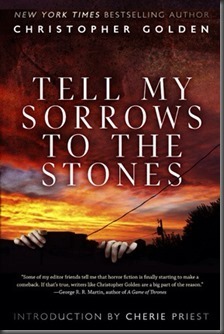 Your short story collection, Tell My Sorrows to the Stones, was published by ChiZine last month. How would you introduce the book to a potential reader? Is there a unifying theme for the stories within? I’ve written short stories for as long as I’ve been writing novels. My previous short story collection, The Secret Backs of Things, collected everything I had done up until that point. But it felt to me as if somewhere along the way I reached a point where I felt as if I’d actually sort of figured it out – this whole short story thing. I’m not saying I don’t like any of my older stories. I like them just fine, most of them. But I do feel as if I grew up a little bit somewhere in there, passed a kind of threshold where I understand the form better than I had before. I often say that my novel Strangewood was when I grew up as a novelist. I think the stories in Tell My Sorrows to the Stones represent a similar maturing, only this time in short story form. There’s more thought in them, for me. More reason for them to exist than the other ones had. A lot of them are about folklore and imagination and belief in general – not religious faith, but faith in ourselves and how dangerous it can be to misplace that sort of faith. What inspired you to write the short stories? And where do you draw your inspiration from in general? I grew up loving short stories, both in the works of Jack London and–much more commonly – in anthologies and collections of horror stories. The combination of Stephen King’s Night Shift and the various anthologies edited by Charles L. Grant (I think I started with Terrors before going on to the Shadows series) had a huge influence on me. Then I went backwards, reading things like Alfred Hitchcock’s More Stories for Late at Night and collections of HP Lovecraft stories and Edgar Allan Poe. As for inspiration… it comes from everywhere. Sometimes it’s a dream or a nightmare, and sometimes it’s just that eureka moment that is the writer’s most invaluable and most indefinable tool. I have a lot of my ideas while traveling, and I often make sense of them while I’m in the shower or taking a walk. I don’t remember how it began for me. It was just there. Twilight Zone and Kolchak the Night Stalker and movies on Creature Double Feature were all on my TV. My favorite comics included Tomb of Dracula and Werewolf by Night. When I started reading, I gravitated immediately toward Stephen King and creepy stories. I remember picking up The Stand in an an airport bookstore… same with various novels by Graham Masterton. From that point, I accumulated horror novels at absurd speed. I’m incredibly fortunate. 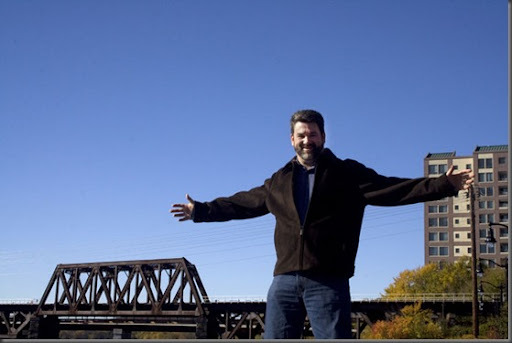 I took the big leap right after selling my first novel twenty-one years ago and never looked back. That said, it’s not for the faint-hearted, this full-time writer thing. It’s always a financial roller coaster, but it’s never boring. I write five or six days a week (sometimes seven). Most mornings are taken up by emails and paperwork and phone calls and I do most of my writing just before lunch and then throughout the afternoon. Often I work a few hours on Saturday morning – unless I’m really under the gun, and then I’ll work the whole day or whole weekend… And feel horribly guilty about neglecting my family. I usually have music on while I’m writing. I’m not one of those Starbucks writers, who can sit in a cafe and concentrate… Although I’d like to be. I may have to try it out. I started writing short stories in high school. I kept it up all through college, but it wasn’t until I started my first novel during senior year that I realized it was really the only thing I wanted to do. The first thing I was ever paid to write was an interview with Craig Shaw Gardner that was published in Starlog Magazine. My first short story was “One”, in Deathrealm Magazine. 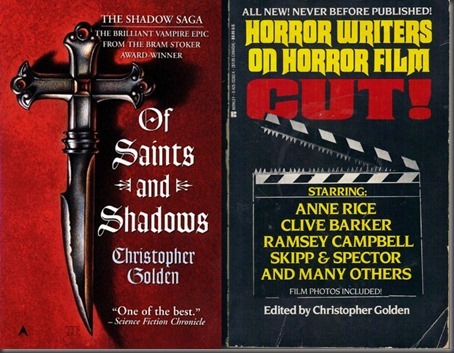 My first novel, Of Saints and Shadows, came out in 1994, but my first book was actually a non-fiction anthology I put together called CUT! : Horror Writers on Horror Film. I look back fondly on all of them. I feel like the genre these days is sort of like the Republican Party – splintered and scattered. There are fine writers working in the small press, but the small press has shrunk quite a bit over the past five years or so. A lot of the publishing dedicated to horror at mainstream houses has vanished, making it harder for casual readers to walk into bookstores and discover new horror writers. 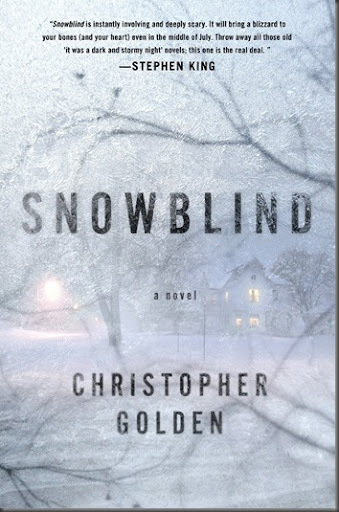 On the other hand, there are still publishers who do original horror, including St. Martin’s Press, who are publishing my new novel SNOWBLIND in January. On the other hand, horror as a genre has bled into other genres – urban fantasy, thriller, mystery, literary fiction. Examples are everywhere. It’s a guerrilla genre, now. As far as where my work fits…? It fits wherever readers want it to fit. That’s not a cop-out. I write in a variety of genres, different shades, and they all have horror in them, including TIN MEN, the near-future SF military thriller I’m finishing now. SNOWBLIND comes out in January, as I mentioned, as does DARK DUETS, the new anthology of collaborative stories I’ve edited. 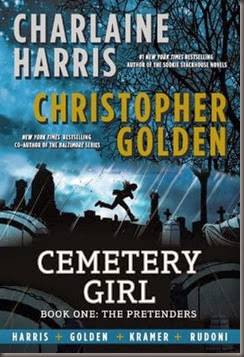 Also in January is CEMETERY GIRL: THE PRETENDERS, the first book in a graphic novel trilogy I’m doing with Charlaine Harris. I’m finishing up TIN MEN, working on a SONS OF ANARCHY comic book miniseries and the continuing series of BALTIMORE comics with Mike Mignola. In a few days I’ll be starting work on a new ALIEN novel. 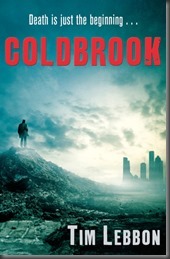 I’m reading Tim Lebbon’s fantastic novel COLDBROOK, which is a monstrously cool pan-dimensional SF zombie thriller. I’m a TV addict who loves music, musical theatre, movies and ice cream. I teach a writing workshop to 7th and 8th graders from my daughter’s school, and I spent a few years directing junior high musical theatre, which I miss terribly and wish I had time for. World Fantasy Convention in Brighton, UK… And as much free time with my family as I can manage.